Amaund Motierre is a Breton of questionable background and employment, first encountered within Volunruud with his bodyguard Rexus. 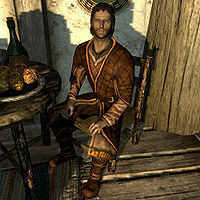 He plays a major role in the Dark Brotherhood questline, during which he hires them to assassinate the Emperor. Upon meeting Motierre, you are given a note with vague instructions for three separate killings. It is then revealed that these contracts will set the stage for the death of the Emperor, the main contract for which the Dark Brotherhood has been hired. Motierre is a cautious man, refusing to divulge any information about himself or his aims. He also refuses to outright reveal the names of the first three targets in his note, instead offering a necklace to cover the costs of investigating the vague instructions therein. Delvin Mallory identifies the necklace as being uniquely made for members of the Emperor's Elder Council, which leads Astrid to deduce Motierre's motives: "Motierre, you naughty, naughty boy. Hiring the Dark Brotherhood to help you rise beyond your station. Delicious." After completion of the contract, Motierre expresses his profound gratitude, saying that you have done the Empire a greater service than you might realize. He wears fine clothes and a pair of fine boots. When he moves to the Bannered Mare, he also carries a flawless garnet, a flawless ruby, a sapphire, an emerald, and a diamond. "The Night Mother heard your pleas, Motierre." "Yes, um.... So it would seem. Well, I won't waste your time. I would like to arrange a contract. Several, actually. I daresay, the work I'm offering has more significance than anything your organization has experienced in, well, centuries." "You have opened the door to darkness, little man." "Oh, I know. I know. But I'm so glad you're here. Please, allow me to state my business. Surely your time is as valuable as my own. I would like to arrange a contract. Several, actually. I daresay, the most important work your organization has had in, well... centuries." "Right, then. You prefer to listen, is that it? Well, you must represent the Dark Brotherhood. I certainly wasn't expecting anyone else. So I'll cut to the chase. I would like to arrange a contract. Several, actually. I daresay, the most important work your organization has had in, well... centuries." "Leaders rise and fall. Business is business." "Oh, wonderful. You don't know how happy I am to hear you say that. So much has led to this day. So much planning, and maneuvering. It's as if the very stars have finally aligned. But I digress. Here, take these to your, um... superior. Rexus. The items." "You want us to kill... the Emperor? Of Tamriel?" "That is correct. What I ask is no small thing, of course. But you represent the Dark Brotherhood. This is... what you do? No? You must understand. So much has led to this day. So much planning, and maneuvering. Now, it's as if the very stars have finally aligned. But I digress. Here, take these. They need to be delivered to your, um... superior. Rexus. The items." "It's a shocking request, I know. But it is inside the purview of what you Dark Brotherhood types do. Isn't it? If history is to be believed? You must understand. So much has led to this day. So much planning, and maneuvering. Now you're here, as if the very stars have finally aligned. But I digress. Here, let me give you these. They are to be delivered to your, um... superior. Rexus. The items." Regardless of how you choose to respond, Amaund will end with "Rexus will now give you two items which must be passed along to your superior. The sealed letter will explain everything that needs to be done. The amulet is quite valuable - you can use it to pay for any and all expenses." When spoken to after the attack on the Dark Brotherhood Sanctuary, Amaund will be shocked to see you: "What is it? I said I didn't wish to... be disturbed." Whether you choose to tell him you have unfinished business with him, that Sithis is due a soul, or remain silent, he will reply, "By the gods. You... you're alive! But I had heard... your Sanctuary... Please! You mustn't think I had anything to do with that! I wanted the Emperor dead! The true Emperor! I still do! It was Maro! 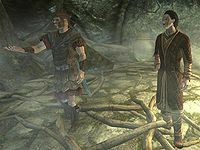 He..." When you demand to know where the real Emperor is, Amaund will be astounded: "You mean, after all that's transpired, the Dark Brotherhood will still... honor the contract? Why, this is astounding news! Wonderful news! The Emperor is still in Skyrim, but not for long. He's onboard his ship, the Katariah, moored offshore in the Solitude Inlet. But you must hurry! If you can get onboard that ship. Kill Titus Mede II, as contracted... I will reveal the location of the dead drop that holds your payment." Amaund will be very pleased once the contract is complete: "Aha! You're back!" Upon telling him that Titus Mede II lies dead, he will respond, "I know! I know! I received the news not moments ago! Ha ha! This is glorious! My friend, you may not realize it, but you have served the Empire, indeed all of Tamriel, in ways you cannot possibly imagine. Ah, but you care little for politics, am I right? You want money! And money you shall have! Your payment waits for you at a dead drop. It is inside an urn, in the very chamber where we first met, in Volunruud. Now please, go. Collect your money, and let us never look upon one another again. Our business, thank the gods, is concluded." "Just a favor... for an honorable man." "You assassins and your riddles. It really does get very annoying, you know. Now if you'll excuse me..."
"Today is the luckiest day of your life." "Ha! Well, I certainly do feel that way. Now, if, um... you'll get going?" "Yes? No? Nothing? Very well, then. If you'll just... get going now..."
Whichever your reply, Motierre will dismiss you with "Oh, for the love of Mara, would you please just go?" After this point, he will remain in the Bannered Mare for the duration of the Hail Sithis! quest. Once the quest is complete, he will leave Skyrim for good. If you decide to kill him instead as the Emperor requested, he will say, "But... we had a deal..." as he dies. He is voiced by Alexander Brandon. If you ask Babette about your contract during The Silence Has Been Broken, she will say "The man you need to speak with, his name is Motierre? That's a very old and powerful Breton family, firmly established in Cyrodiil. Most curious..." One member of this family, Francois Motierre, was part of the Dark Brotherhood questline in Oblivion and another, Mirabelle Motierre, was part of the Dark Brotherhood in ESO. You can kill Amaund—either through your own volition or as the Emperor's last wish—in order to claim a small amount of gems, worth a considerable amount of money. The version found in Volunruud during The Silence Has Been Broken has a baseID of 0003b43a and a refID of 0003b43b. He has tied long hair with no beard. The version at The Bannered Mare has a baseID of 0004e64f and a refID of 0004fa2f. This one looks slightly more unkempt and haggard, as he is starting to grow a beard and his hair is shorter and not as finely groomed. Version 3.0.6 of the Unofficial Skyrim Legendary Edition Patch modifies the version at the Bannered Mare to look like the original version in Volunruud. This page was last modified on 12 September 2016, at 17:54.